Yesterday we discussed the pros and cons of mixing on headphones. If you haven’t chimed in on the discussion, head over there. Lots of interesting comments. I’m not here to say that mixing on headphones is better than mixing on monitors. However, it has been my experience that you can get a good mix on headphones, even though there are a lot of people who claim you can’t. The moral of the story isn’t that you can always get a good mix on headphones. 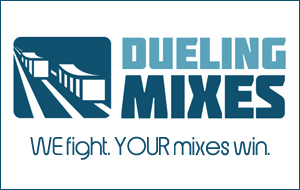 No matter what your mixing/monitoring environment is, it’s your job to learn how to get good mixes out of the equipment you have. That said, any pro engineer will tell you that while they CAN get a good sound with cheap equipment, using high-end gear oftentimes makes it much easier. In my Intro to Headphones video, I explained the 3 different types of headphones: closed, semi-open, and open. Closed headphones are designed to keep the sound from leaking out of the headphones. Think Sennheiser HD280pro’s* or Sony MDR-7506’s. * These are great for tracking. The musician can record without any bleed from the headphones getting picked up by the microphones. Open headphones don’t prevent the sound from escaping the headphones. Rather than enclosing the drivers, the back of these headphones are open to the air. These tend to be more accurate and are better for mixing than closed headphones, but they’re not good for tracking, since everything bleeds out of the headphones. Semi-open headphones are a blend of the two. The Sennheiser HD-650’s are open headphones. If you look at the outside of the cup, it has a bunch of little holes, rather than being solid plastic. I’m not smart enough to know the physics behind open headphones, but in general open headphones have clearer highs and deeper lows. With closed headphones, the sound is bouncing around inside an enclosed area, which leads to a less-than-flat frequency response. Open headphones allow the sound to “breathe,” so to speak. Think about it this way. Recording an acoustic guitar in a tiny closet might seem like a good idea, but with the sound bouncing around that tiny room, you’ll likely end up with a boomy, uneven sound. It’s the same with headphones. The problem with a lot of closed-back headphones is that they simply can’t effectively reproduce bass frequencies very well. Anything below 100 Hz is still there, but it’s not as loud as the mids and highs. If you’re using closed headphones for mixing, it’s tempting to crank up the bass in your mix, so that you can hear it. While this is understandable, and may even sound good, you’ll find that as soon as you play your mixes on monitors or in your car, you’ll find that there’s WAY too much bass. You boosted the bass to make it sound good in the headphones, but it turns out your headphones were lacking in bottom-end…and you over-compensated. I’ve been there. Boy, have I been there. The HD650’s are a different story. The first time I listened to them, I was literally shocked by how much bass they had. To be completely honest, I thought they had too much bass at first. But after spending a lot of time with them, I realized that they were simply reproducing the bass frequencies that were actually there in the recordings I was listening to. All my life I had listened to music on headphones that rolled off the low bass frequencies. With the HD650’s, I could, for the first time, hear the entire frequency spectrum through a set of headphones. It took me a while to really articulate what I was hearing. Essentially these headphones extended both the low and high frequency response of what I was accustomed to hearing through headphones. I could hear the highs more clearly, with more detail, and obviously I could hear the low end, too. It sounded like someone removed a high-pass and low-pass filter from the signal, extended the frequency response both ways. With regards to the bass, the sound I get from these headphones reminds me of what it’s like to listen to a mix on big studio monitors. The bass is present, not hidden. It comes through clearly, even at lower volumes (which helps tremendously with ear fatigue). These are probably the most comfortable headphones I’ve ever worn. They fit completely around my ears. Some headphones tend to rest on the ear, which leads to soreness over time. Since these hardly touch my ears, I can wear them for hours with very little fatigue. As I write this, the HD650’s sell for $450-500 USD. You may see that price and think that’s a ridiculous amount of money to spend on headphones. I get it. But think about it this way. What would you spend on a decent, entry-level pair of studio monitors? $300-500, right? Then if you wanted to upgrade to something more professional, you’d spend anything from $1,000 to well over $2,000 for a pair of high-end studio monitors. While I’m not saying the HD650’s are as good as a high-end pair of Genelecs or Adams, they are very good. When you think about it this way, suddenly that price tag doesn’t seem like a big deal at all. One thing to note, the impedance on these headphones is considerably higher than normal headphones. This means you have to drive them a little harder to get the same volume out of them. If you’ve got a cheap interface, you may want to consider getting a standalone headphone amp (like the Presonus HP4*). Also, this wasn’t listed above, but the headphones use a “Y cable” to connect to the headphones. The cable splits and connects to the left and right side separately. The connectors aren’t hardwired to the headphones. You can remove them by just pulling them out, so they can be easily replaced. I bought these headphones myself…and I could not be happier. I’ve used them for both mixing and mastering projects, and I’m getting very consistent results. Am I going to throw away my studio monitors? Not at all. I use them all the time, but the Sennheiser HD650’s are my go-to piece of gear when I really need to hear something accurately. The Sennheiser HD650 headphones* get a big thumbs up from Joe Gilder and Home Studio Corner. What do you think? Do you have them? Do you want them? Leave a comment below.